Introduction: Goodness me, it has been a very long time since I last reviewed a book, not since late August of 2015!! Unfortunately, the demands on my time during the school year have made reading fiction nearly impossible. Indeed, during the 2016-17 academic year, as I ended up writing over 160 pages worth of essays, I was only able to read one work of fiction – Shusaku Endo’s Silence – but it was a book I felt I should not review on the blog. Now that summer is upon us, I can take a deep breath, step back from academia, and read a little bit more fiction. So I decided to treat myself with some mysteries. My reviewing may be a little rusty, so I please ask you to forgive me in advance. As Alice Arisugawa’s The Moai Island Puzzle begins, we are introduced to a group of students at Kyoto University who are on their way to Kashikijima Island in order to solve a puzzle leading to hidden treasure. One of these students is the author, Alice Arisugawa, who along with his friend Mr. Egami is heading to the island on the invitation of their friend Maria. (Alice, by the way, is a male name here.) Maria’s grandfather, Tetsunosuke Arima, hid a collection of diamonds somewhere on the island, but neglected to tell anyone the location of the treasure before dying. All that is known is that the moai statues all over the island, inspired by the Easter Island statues, are the key to solving the puzzle. 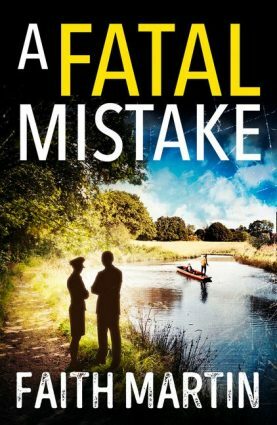 It doesn’t take long for the murders to begin, as two bodies are discovered. The victims were shot, but the rifle used is nowhere in the room, and all potential exits (the window and the only door) were locked. More mysterious events occur, and it is up to Mr. Egami to solve the puzzle, with Alice acting as his Watson. 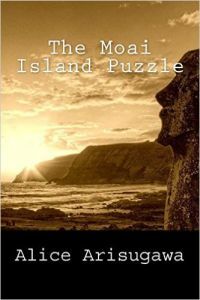 Published in English in 2016 by Locked Room International, The Moai Island Puzzle was translated from the Japanese by Ho-Ling Wong, and includes an introduction by Soji Shimada (author of the brilliant The Tokyo Zodiac Murders). In his introduction, Shimada gives this book, originally published in 1989, a lot of credit for reviving interest in the traditional honkaku style of detective fiction in Japan, giving rise to the shin honkaku (“new orthodox”) style. I must begin with a quick round of applause to Ho-Ling Wong for his translation. Following on the heels of his work on The Decagon House Murders, this translation is excellent – it is readable, but it also gives you a sense that the translator is sticking as closely as possible to the author’s original text. This means some things have to be explained to the non-Japanese crowd (e.g. “Maria Arima” being a palindrome in Japanese), but these explanations are wonderfully incorporated into the text, occasionally via footnote. I hope Ho-Ling will follow this up with more translations. Ironically, the weakest thing about The Moai Island Puzzle is the titular moai puzzle! You see, relatively early in the book, we are informed that the puzzlemaker Tetsunosuke Arima had given a hint for the moai puzzle’s solution, and this hint eventually guides our detectives to the correct solution. However, this solution relies on an interpretation of the word “evolution” which simply does not ring true in English – although to be fair, part of this objection might be coming from my previous scientific studies. I cannot be more specific due to spoilers, but it was the treasure-hunting aspect of the book which ultimately did not quite satisfy – I felt like I never would have had the chance to figure out this aspect of the book before the detectives. In all due fairness to the author, though, this aspect of the puzzle got solved long before the Ellery Queen-inspired “Challenge to the Reader” is issued. Thus, despite this complaint of mine, the book as a whole has a meaty plot which offered plenty of satisfying mysteries and resolved them satisfactorily. As a result, I found the The Moai Island Puzzle to be a very good book indeed overall. I liked the identity of the culprit, which semi caught me off guard. I also liked how some of the story’s apparently more complex aspects had simple solutions at their core – in particular, I had my doubts that the author could explain why the murderer’s plan in one part became so complicated for no apparent reason, but this aspect and potential nitpick was addressed with a disarmingly simple solution. As for the locked room mystery, the explanation is also one of those simple but satisfying one, which I tend to prefer over solutions of mechanical ingenuity which require an engineering degree to comprehend. The only other quibble of mine is that the characters are not particularly memorable. Because the Japanese names are so unfamiliar to a Western reader like myself, this meant that I occasionally had to consult the list of characters at the start of the book, especially before the first murder occurred. For me, this is not a dealbreaker at all, though: the characters were developed as needed for the plot, and the story is so enjoyable that it wouldn't have mattered if the characters had literally been cardboard cutouts. Overall, I really enjoyed The Moai Island Puzzle. After such a long time away from detective fiction, it was nice to sink my teeth into a mystery of this calibre, and I got a lot of enjoyment out of it, even if one of the puzzles had its problematic aspects. This was a quick, enjoyable, and stimulating read, and I hope we have not seen the last of Alice Arisugawa in English. This is getting weird! I mentioned you in my last review, in reference to the never-ending string of coincidences plaguing mystery-themed blogs, saying I wish you were still around to accuse the ghost of Harry Stephen Keeler. And an hour, or so, after it got posted you stir back to life. I do not know what's going on, but we should try to harness its power and reshape the world in our own image. Anyhow... welcome back! Glad you enjoyed The Moai Island Puzzle and you (maybe) sticking around this time, but be warned, you might be overwhelmed by the current avalanche of GAD reprints. I know it's exactly what we wanted, but you got to complain about something, right? That is an extraordinary coincidence, especially because this was supposed to go up a few hours sooner than it did. I never entirely disappeared - I took note of all the GAD reprints and approved, while my bank account got smaller and smaller - but for the next little bit I have the chance to read the kinds of books I like. I'll have to stagger my reviews so as to make this period of time last a little longer. Yeah, the treaure hunt is technically fair, but I seriosuly doubt anyone is going to be solving it -- the reader just has to watch that unfold and be surprised by it. Thankfully the rest is very cleverly put together, and I completely agree wtih you that at times the plan seems so hideously complex that there's no way it could possibly be explained in a comprehensible manner (I had exactly the same feeling about Rim of the Pit, weirdly, and shades of that experience came back to haunt me here). 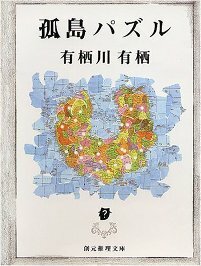 More translations of Arisugawa would be very welcome, as would any of the apparently wonderful honkaku stories Ho-Ling keeps taunting us with...hopefully something will happen, LRI seem prety committed to producing at least one Japanese title a year now, and there seems to be a lot of awesomeness still unknown to those of use too lazy to learn the language. It seems that we are more or less in agreement about this book! Ha, then I apologise for tarring you with my brush!